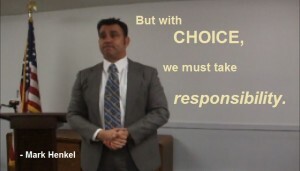 Whenever I share my belief in the power of choice, I also always add, “But with choice, we must take responsibility.” Indeed and to wit, I made that very soundbite during my speech, The Anti-Socialist. It is that corresponding issue of taking responsibility which sometimes complicates how some people perceive the power of choice. If we fellow human beings had the anarchy to make choices without consequences, the laziness aspect of our human natures would certainly succumb to that. But we must remind ourselves that, if there are no consequences, then that also means that there would be no positive consequences either. As such, because we do have hope for positive consequences, we must make our choices with the expectation of consequences, no matter what. Alas, that expectation does simultaneously risk the possibility of negative consequences too. If we choose to not take responsibility for our choices, any negative consequences from our choices will fall onto others. Thereby, the consequences of our choices become the consequential burdens imposed on others, diminishing their range of choices for their own selves. Socialism pretends to “backstop” the negative consequences of our choices. But the actual consequence of that pretended “backstopping” is that it simply re-distributes the burdens of those negative consequences of our choices onto others against their own preferred choices. For the true freedom of all of us to maximize our human power of choice, we must each take responsibility for our choices – whether the consequences are positive or not. For that powerfully important reason, I am an Anti-Socialist. As part of the larger project to develop tools of shareable memes to polygamy supporters, the pic for this sound-bite has been posted on Pinterest. Pinterest PIC: But with choice, we must take responsibility.